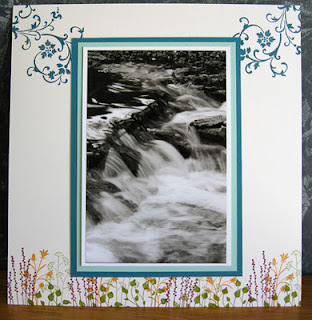 Do you like your scrapbook pages to look clean and uncluttered? Perhaps you have a special photograph of a place or moment in time where you want the focus of attention to be the photo rather than the embellishments on the page. Here’s a quick and easy page layout that can be adapted to suit any photograph. Start with a base of Whisper White cardstock cut to 8” x 8”. 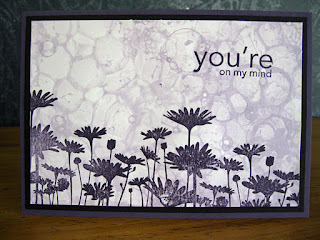 Stamp the flourish from Elements of Style in the top left and right hand corners using your Island Indigo stamp pad. 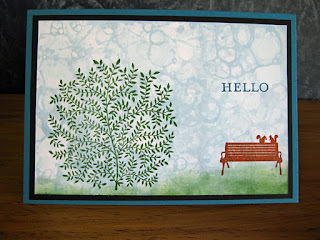 Along the bottom of the page, stamp the images from Pocket Silhouettes with Peach Parfait, Old Olive, Pear Pizzazz and Rich Razzleberry ink, overlapping the images. Mat your photo with Pool Party cardstock and then Island Indigo, leaving about 1/8” border around each mat. 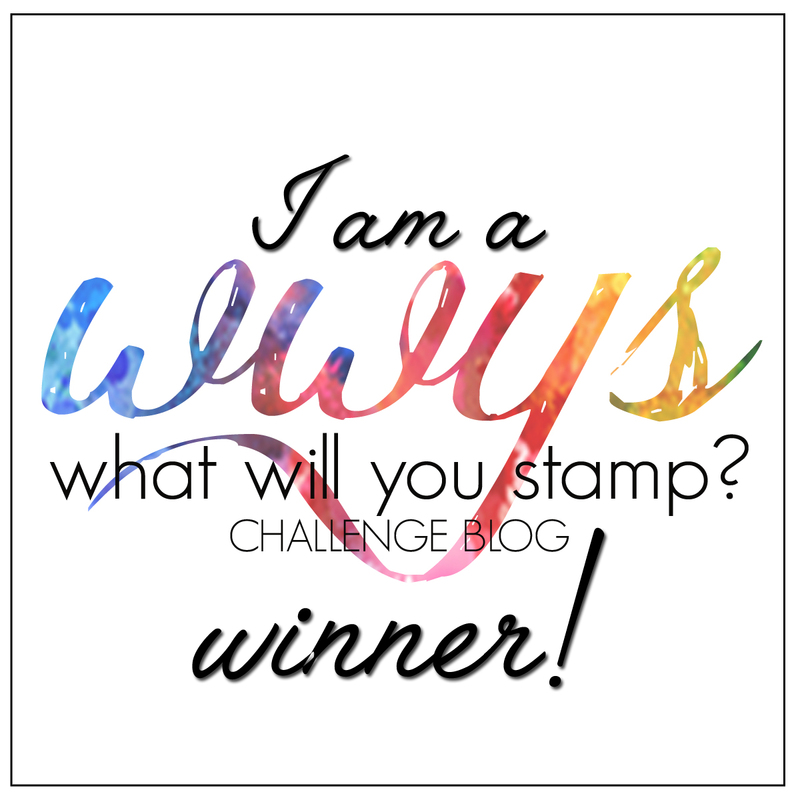 You might like to write a title at the top of the page using your Stampin Write Markers. If you would like to order any of the supplies used to make this page, please don’t hesitate to call or email me. 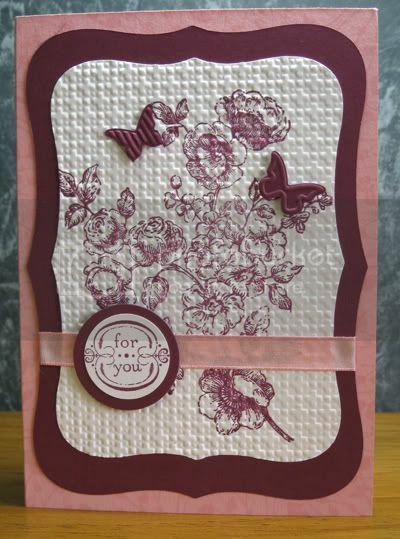 Here's another sample of the Bubbles Background technique that uses one of my favourite stamp sets, Fifth Avenue Floral. I used 2 colours to create the background, and used masking to create the effect of some flowers appearing to be behind others. What do you think? Which is your favourite Bubbles Background technique card? Let me know by leaving a comment below. I think this one is my favourite. I found another couple of cards I haven't shared yet, that use the Bubbles Background technique. I like a technique that can be used with different stamps and greetings to create cards for different occasions, and that is not too fussy or time consuming. Tomorrow I'll show another card that uses the same technique. Hopefully I'll upload a video on the technique that will be available to my newsletter subscribers soon! Here's another sample using the Bubbles Background technique. This time the stamp set is Upsy Daisy, another one of my favourites. It's pretty easy to make, and if you want to add embellishments, if that's your style, then go right ahead. Perhaps a butterfly could be added to the card to give it dimension... If you make up a card using this technique, let me know, I'd love to see it. Don't forget, Sale-a-bration is on now, so be sure to take advantage of the freebies on offer. 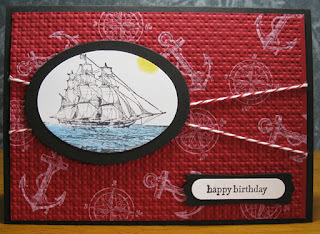 Today's card is another sample I made to show at the Stampin Up Regionals seminar in Adelaide. It uses the Bubbles Background technique and the Inspired by Nature stamp set, which is one of my favourites. The sentiment comes from the same set, but you could use a different sentiment if you like. I'll be posting another card tomorrow, so be sure to come back then. Would you like to make a set of general greeting cards using this technique? I'll be running this as a class in February, so book in today. Cost is $25 with all materials supplied, or $20 if you bring your own adhesives. What to bring: basic tool kit with trimmer, scissors, ruler, etc. 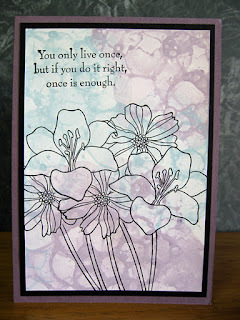 Today's card is one the talented Tamara Conroy showed us how to make at our monthly get-together. 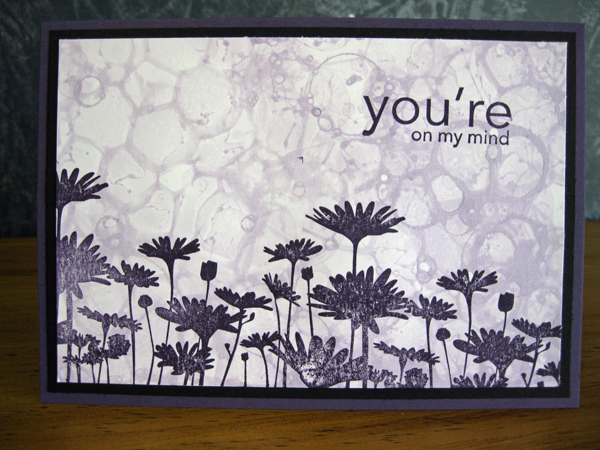 It can be for any occasion, such as a Thinking of You card. Accessories: Champagne Glass Glitter for the centres of the flowers, Dimensionals. After cutting out the flowers we sponged the edges with Pretty in Pink ink, curling the petals a bit with our fingers. The same treatment was given to the leaves to add more depth. All supplies are available from me, so if you would like to make this card yourself, send me an email and I'll order them for you. Last year I was asked to demonstrate a technique at the Stampin Up Regionals in Adelaide, so I decided to show the Bubbles Technique. I had to prepare a few samples using different stamps, and here is one of them. 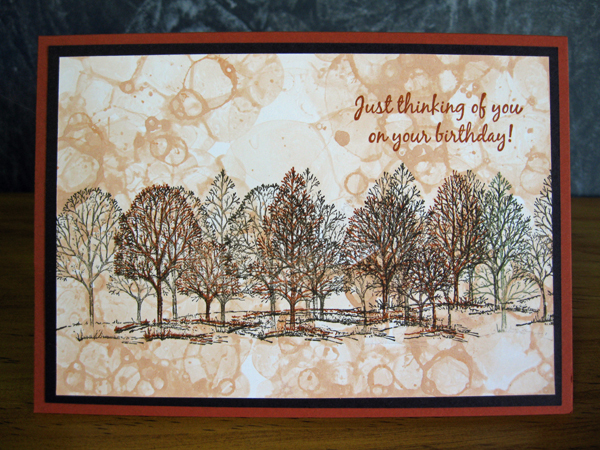 I actually made a mistake on this one, then decided just to keep stamping the trees, and it turned out looking more like I had deliberately stamped it like that! Just goes to show a mistake can end up being a creative technique. I've been making a video on the technique, as it's much easier to watch how it's done rather that explain it here or use still photos. When the video is finished and uploaded, I'll make it available to my Newsletter Subscribers. 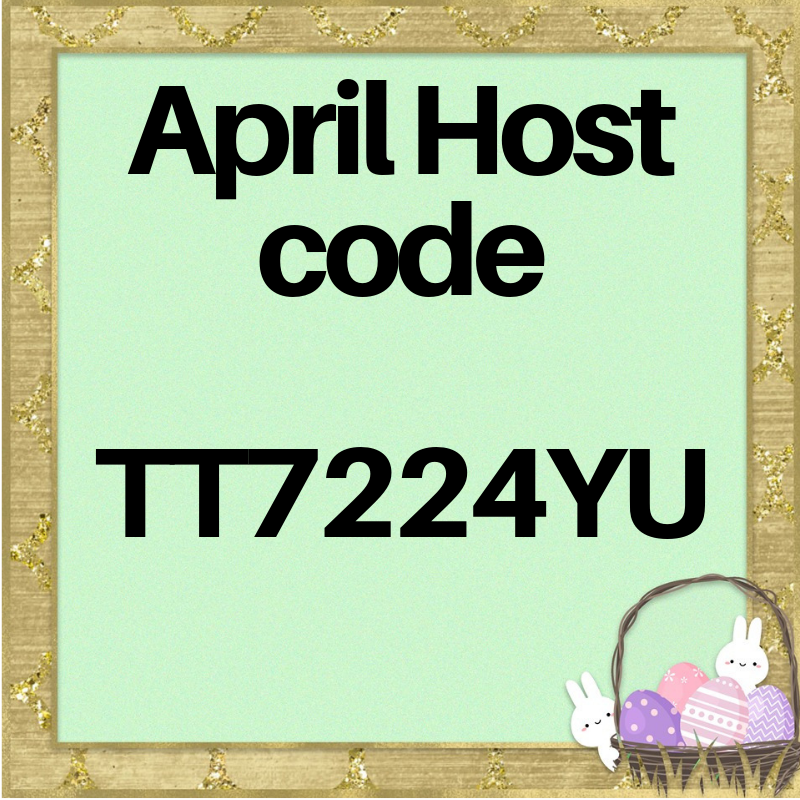 So if you're not on my Mailing List, be sure to sign up for it now! Today's card is a quick and easy card to make and can be adapted to suit any occasion or sentiment. This one was my contribution to our monthly get-together to share card ideas. 1. 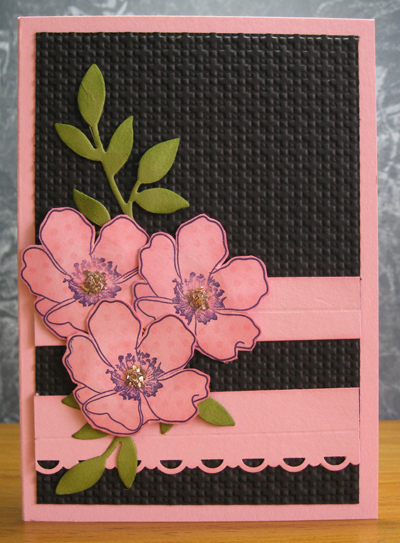 Stamp the small leaves stamp from Pocket Silhouettes using Versamark all around the Pretty in Pink card front. 2. Cut a large label shape out of Rich Razzleberry cardstock using the Nestabilities die. 3. Cut a smaller label shape (I used the next size down) out of Whisper White cardstock. 4. 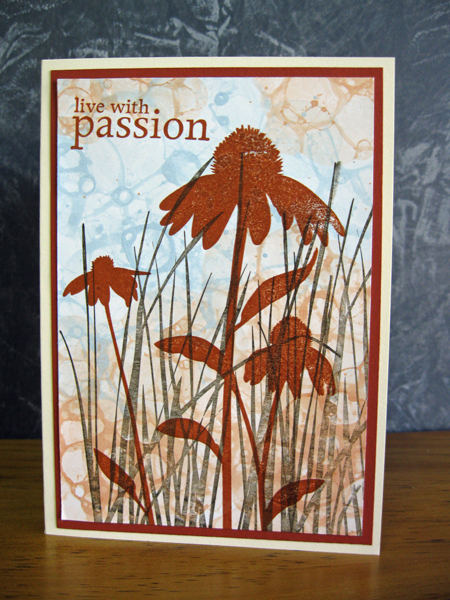 Stamp the flower image from Elements of Style, using a Rich Razzleberry stamp pad onto the white label shape. 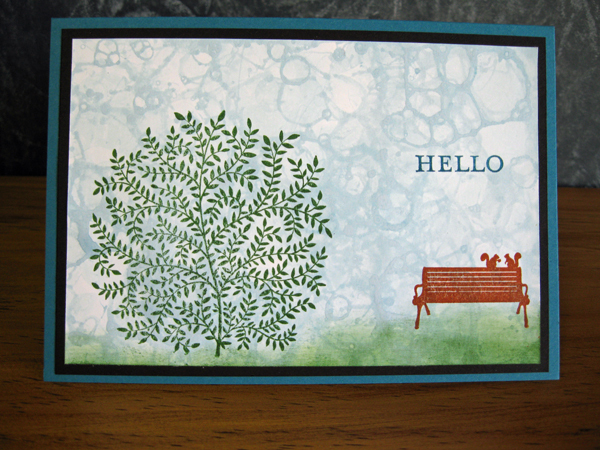 Put the while label inside the Square Lattice embossing folder and run it through the Bigshot. 5. 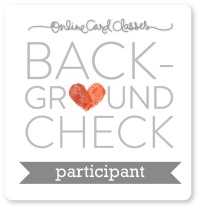 Stamp the sentiment onto a small piece of Whisper White cardstock and punch out with the 1" circle punch. Layer that onto a 1 1/4" circle of Rich Razzleberry. 6. Cut the small butterflies from a small piece of Rich Razzleberry using the Beautiful Wings Embosslits die in the Bigshot. 7. Assemble your card as in the photo, using dimensionals to raise the sentiment above the ribbon. If you would like to order any of the supplies listed, please email me or leave a comment below and I'd be happy to get them for you. The Summer mini catalogue is available now, and runs through to March 31. You can view it online HERE. I have some copies on hand, so if you would like your FREE copy, just email me your details and I'll post one to you (Australian addresses only). If you like the Stitched Stockings stamp set and matching punch, please be aware that these will NOT be in the next "big" catalogue, which will be released in September. So if you would like them for your Christmas cards this year, make sure you order them soon. A lot of people, myself included, find it difficult to come up with a birthday card suitable for a male. We don't want something that is too feminine, and not something that is too dull either. At our January get together, Jenny Soulsby showed us how to make this card, which she found on Splitcoast Stampers, by "barefootscrapper". It's my husband's birthday next month, so for once I have a card already made up! It showcases a great stamp set called The Open Sea, which is in the Summer Mini Catalogue, which means it's only available until 31 March 2012. Do you have the Summer Mini Catalogue yet? If you would like your free copy, please email me with your details and I'll post one for you. Tools: Ovals Dies and Big Shot Die Cutting Machine; Square Lattice embossing folder, Modern Label and Word Window punches. 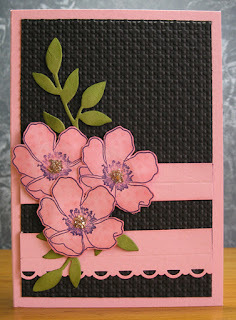 Accessories: Cherry Cobbler/White Bakers Twine, Dimensionals, Stampin Pastels chalks. I hope you like this card. If you've made a great male birthday card, send it to me and I'll post it on my blog! It was our 17th Wedding Anniversary last week, and here is a card I made for my husband. 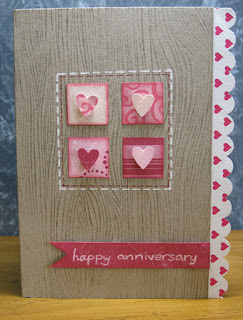 It was inspired by a similar card on Kristina's blog which is for a Valentine's Day card. I used up some bits and pieces from my stash, including some ancient CM paper. 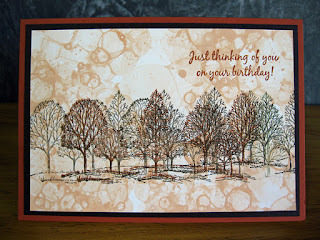 Non SU: Woodgrain stamp, CM paper. What do you think? He loved it! Would you like to make some quick and easy cards like this? 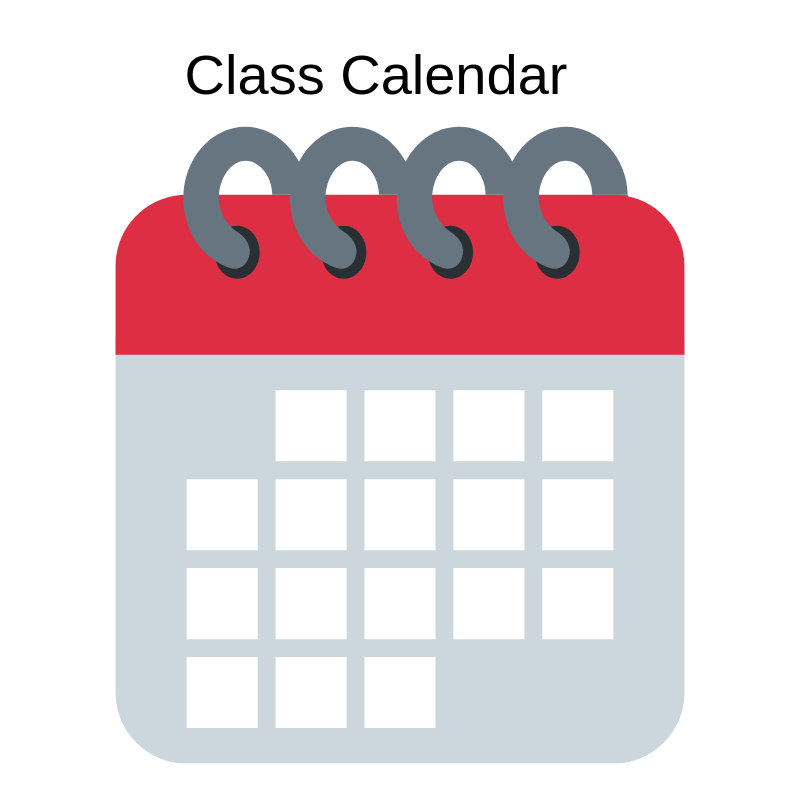 Why not email me to book into a class today! 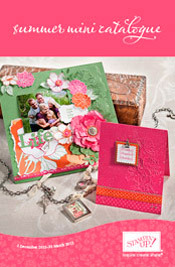 Or if you would like to purchase any of the Stampin Up products listed, email me with your order! 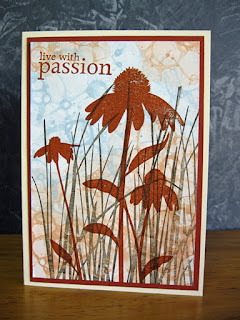 Sale-a-bration is Stampin Up's promotion to kick off the new year with a bang. In previous years there have been 4 exclusive stamp sets for you to choose from for every $100 worth of supplies you order, this year there's a paper pack of 12 sheet of double sided 12" x 12" paper in some gorgeous designs, as well as a ribbon and brad pack. Sale-a-bration starts January 24 and runs through to March 31. If you would like me to send you a brochure, please email me or send me a message through Facebook.